Engage your audience during presentations without breaking your budget with the NEC NP610, a value-driven installation projector ideal for higher education and corporate environments. This model delivers remarkably bright images and features easy-to-use networking technologies, high contrast and up to 5000 hours of lamp life (in ECO ModeTM). 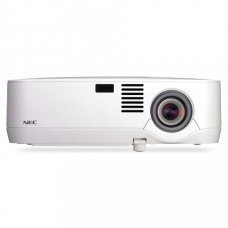 Whether in the classroom or boardroom, the NP610’s multitude of advanced technologies allows you to connect with your audience using bright, colorful images and crisp text. Instantly projects a square image even when the projector is set up at a steep offset angle to the screen.